According to a recent study by Transparency Market Research (TMR), the global market for refinery catalysts is well organized and consolidated among four players who collectively owned more than three-fourth of the shares in 2015. These four vendors are Royal Dutch Shell Plc., Chevron Corporation, Sinopec Corporation, and ExxonMobil Corporation. With an impressive product portfolio and distribution channels across various regions worldwide, these four companies are significantly ahead of the curve in the global refinery catalysts market. The TMR report expects this dominance to continue in the near future as these leaders continue to research and develop new products with their financial might and continue to add on their consumer base. As per the TMR estimations, the global refinery catalysts market was worth US$11.5 bn and projects it to reach a valuation of US$17.1 bn by 2024, increasing at a CAGR of 3.93% during the forecast period of 2016 to 2024. The slugging growth rate is a reflection of volatile crude oil prices, which severely affects the production and revenue of the vendors operating in refinery catalysts market. The report anticipates this pattern to continue in the near future, and lead to limited development opportunities for new entrants. Based on material, the report segments the global refinery catalysts market into cobalt, molybdenum, zeolites, nickel, and others such as platinum. Out of these, zeolites refinery catalysts accounted for 65.5% of the market in 2015, in terms of volume. This substantial demand for zeolites is owing to its expanding appetite for high octane gasoline across the world. Zeolites are primarily used for the fluid catalytic cracking process, and offer benefits such as high temperature resistance, high selectivity, and cost-effectiveness. Geographically, this report on the global refinery catalysts market evaluates the potential of several regions including North America, the Middle East and Africa, Europe, Latin America, and Asia Pacific. Currently, China not only the leading producer but also the most prominent consumer of refinery catalysts, single-handedly making Asia Pacific the most lucrative region for the players in the global market for the same. 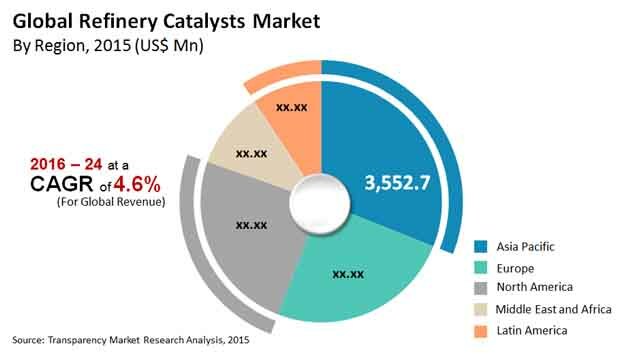 The prosperity of the petrochemicals and refining sectors in India and China will favor the expansion of the refinery catalysts market in Asia Pacific. The report also expects the regions of the Middle East and Asia Pacific to increment the demand for molybdenum refinery catalysts during the forecast period. Growing demand for refined petroleum products, increase in refinery construction across Asia Pacific and the Middle East, and upgrading of existing low NCI refineries are some of the key factors favoring the global refinery catalysts market. In the recent past, regulations pertaining to carbon emission from vehicles, particularly in the developed regions in Europe and North America have proved a boon for this market. With refinery catalysts, quantity of sulfur and other impurities can be controlled. On the other hand, factors such as overcapacity in refineries in developed countries, competition from renewable fuels, and unstable regulatory environment are challenging the market from attaining its full potential. Decline in the consumption of refinery catalysts in Europe, which was a lucrative region for the players in this market, is expected to show quite apparently during the forecast period.